Just for kicks here's a picture of me on my 21st birthday. It seems like it was just yesterday. And 34 seemed ages away....yet here it is. I sure was skinny, but at the time I thought I was so fat. There's a story behind the red dress. I wanted a knock out red dress to wear for my birthday. Red is my fav color but I didn't own a single red piece of clothing. A few days before a friend and I had gone to the mall in search of THE dress. By some miracle, this is what we found. A cherry red 100% silk tank dress on clearance for $15! There was one left --- in my size. I wasn't sure about it when I tried it on, but my friend talked me into it telling me it would be fine once I had my make up on, hair done, and the right shoes on. I guess she was right. I was WAY over dressed for the sports bar we were at. I went out by myself that night. When I walked in, one of my friends yelled as loud as she could "WOAH MEL!" Everyone turned to look to see who she was talking about. All of the 10 people (?) or so that were in the bar at 9:00. LOL!! The guy I was dating had just told me it wasn't working out and he wanted to be just friends. I was so crazy for him. He drove me insane! And he met me there to hang out and celebrate. I think that was part of the motivation to find THE dress! LOL! If I remember correctly, I went out the next night as well with a different group of friends. Ah, those were some fun times. I did get lots of use from that $15 red dress. I wore it to countless parties, Christmas parties, clubs.... I think it was almost falling apart when I finally tossed it!!! I had my 11 week doctor's appointment today. Everything is fine over all. Except that I've lost a little bit of weight from being so sick. My doctor said that maybe it's my gallbladder. 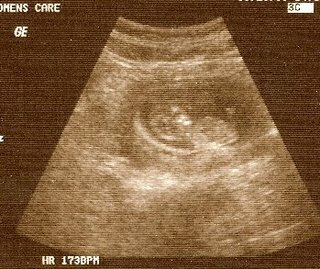 Pregnant women often have gallbladder trouble. I don't know about that since I was so sick with Valerie too. It's possible I guess, and maybe that is why I just feel so bad. The nausea is one thing, but just in general I don't feel well. I go back on the 18th for a gallbladder ultrasound. I'm not to eat or drink anything before my appointment. 9am was the earliest available - JOY!! I can only imagine how bad I will feel that day. My husband, along with a group of friends, got me good today. Earlier in the week Clint said he was thinking about going to lunch today at the Golden Corale to celebrate my birthday a bit early. He said to invite my mom and dad, which I did. I really didn't think anything of it, and was more worried about being sick and not being able to go. Yesterday was just terrible, but luckily I felt good enough to go today. So anyway... my mom and dad got here this morning, visited a while, and we went to eat. We go in, order our drinks, pay, and Clint tells me to go ahead of him and get a table around our ususal spot. I'm looking around to pick a table and I notice one of my friends sitting at a table with a group of people. As I get closer, I see more familar faces... their husbands... and their kids... Basically all of my friends from playgroup. I turned and kind of mumbled to Clint, "why is everyone here?" I started walking towards them (still confused) and they yell "SURPRISE!! HAPPY BIRTHDAY!" Then it sunk in they were all there for me. I started to cry. Talk about total shock. I was shaking. I was not expecting that at all. Clint gave me a card from Valerie, a card from him, and some acessories for my laptop. My friends got together and gave me a gift certificate for a prenatal massage! (wow, can't wait to try that out!!) We sat, ate, and talked a good bit. It turns out Clint was behind it and had asked the girls to help. Clint said he wanted to cheer me up since I had been feeling so down lately. Well, it definitely worked! I'm still in shock. I have to say this was one of the nicest things anyone has ever done for me. It's no secret that I never really like my birthday. But thanks to my wonderful husband and caring friends, this is one birthday I'll always remember in a good way!!! Yesterday was not a good day. It seems I'll have one or two decent days followed by an awful one. Luckily I was able to spend yesterday lying on my mom's couch while they entertained Valerie. I'm just so tired of not feeling well. I'm so worn down physically and emotionally. So drained. And nobody understands. Today is not much better. Valerie was up all night long. I don't know what was wrong with her. Bad dreams? She cried and screamed every few minutes it seems. We brought her in our bed and she continued to throw a fit. At 2am until almost 4am. She kept throwing her pacifier at us. Which made me mad. She will not sleep with out the darn thing, yet kept throwing it at us or on the floor. She even threw her bunny blanket out of the bed. Eventually she calmed down and dosed for a while. But just before 6am, she started again. I decided to just get up. And she's been awake ever since acting like her normal self. While I'm exhausted and feel awful. 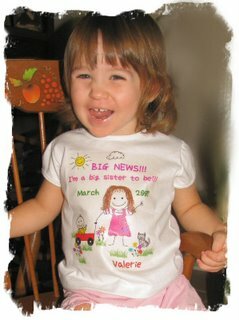 Valerie was 20 months old yesterday. Hard to believe... Time has gone by so fast. Soon she will be two years old!! Every day she is learning something new. She talks up a storm to us at night. She just babbles away and it's so cute. I just bought tickets to take her to se Sesame Street Live in October. A whopping $83!!! I sure hope she enjoys it. We've had a nice weekend so far. Friday night I felt just horrible. Probably the worst I have felt yet. I sent Clint to get me some Poweraid thinking that maybe I am dehydrated. I just can't seem to drink plain water *gag*, so I've been sipping blue Poweraid instead. I can't say that it has made much of a difference, but just maybe I feel a tiny bit better. Yesterday, Saturday, we went to a Kids Day at the civic center. I made myself go even though I wasn't feeling up to it. Several friends had booths, and I wanted to get out of the house to do something together. As soon as we walked in I hear "Melanie's here!!" and next thing I know everybody is at my side asking how I was doing. Clint thought that was funny. I hadn't been to any playgroup stuff in about a month, so I hadn't seen anyone in a while. Of course I got told I looked terrible (which is probably true!!) It's nice to know that I was missed - even a little bit. haha. Valerie had a great time for the little while we were there. Afterwards we got something to eat and did a little shopping at Sam's. I was completely worn out for the rest of the day. Today we are working on cleaning this messy house. Clint has been a big help lately. I bitched at him big time for sitting around all day long one Sunday a while back. He literally sat in front the computer from the time he got up until 4 or 5:00. I feel so bad most days. And on top of that I feel guilty for not keeping up with the housework. I just can't do it. I don't expect him to scrub the floors but he could wash some clothes... especially when most of them are his. He has really been helping lately and I have to say how much I appreciate it. I know he doesn't like doing it, but really -- who does?? It still needs to be taken care of. Last week I rented one of those fetal dopplers to listen to the baby's heartbeat. I had one with Valerie and it was so neat. It got here Friday!! It only took me a minute or two to find our little shamrock's heart galloping away. It certainly is reassuring and well worth the $25!!! I'll probably keep it for two months or until I can feel those wonderful little kicks. My car is finally in the shop being repaired from when I got rear ended back in June. Yep, it took two months to get an appointment!! Crazy. I had to go pick up a rental yesterday. The other person's insurance is paying for it, so I had no idea what kind of car I'd get. I was expecting like a Neon or a cheap Kia... something like that. To my surprise, I got a brand new Dodge Charger. It only has 6000 miles on it. Nice car. It's a bit bigger than what I'm used to, but it works. It's not my Accord though!!! I'm still here. I just don't have anything new to share. *shrugs* I don't think anyone wants to read post after post of me complaining how bad I feel. or how tired I am. or how messy my house is. It's really wearing me down and.... as hard as I try not to dwell on it, it's hard not to. I am still here. And still feeling pretty bad every day. :-( The morning sickness comes and goes, but just don't feel good all the time. I cried and cried the other morning. I felt so sick. Valerie needed me, so I was trying my best to take care of her. I'm doing what I can around the house, which isn't much. Clint doesn't do much of anything. I can't keep up with all the housework and laundry, and I can't stand having my house so disorganized. I just feel too bad or am too tired to keep it up right now. Laundry I can wash but folding is another story. And forget about cooking. I just feel guilty for not keeping up with what I normally would. I'm stuck at home because I don't feel well enough to go anywhere. 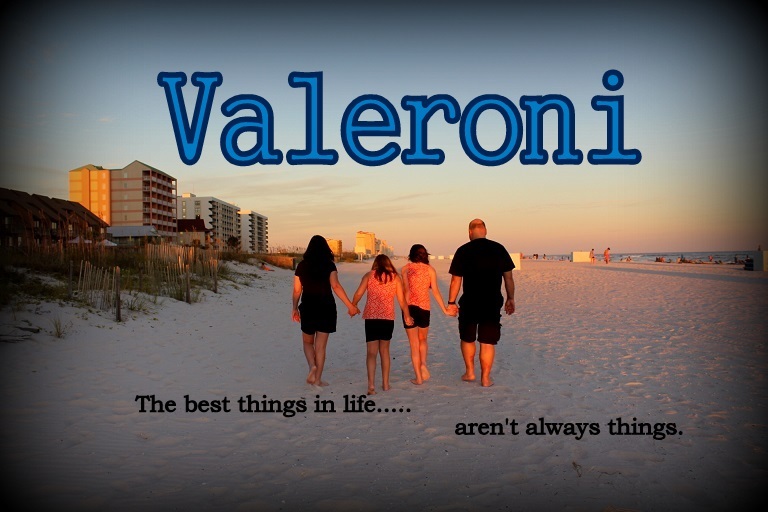 And I'm not supposed to pick up Valerie much anyway. I miss seeing my friends. I guess I am having a big ole' pitty party for myself. Poor Mel. I think I did too much yesterday. Valerie slept unusually late, so I had a few hours to myself in the morning. I cleaned my kitchen, cleaned the living room a bit, washed clothes, and tried to de-clutter. I also made some flowers for my final cake for class. Played with Valerie. Then yesterday afternoon I decided I just HAD to get out of the house, so we went to the Dollar Tree and Ross. It was SO hot going from the car to the store. And I was so tired just from getting Val out of the carseat. (I did manage to find some adorable maternity clothes at Ross!!!) By the time I got home, I felt so bad. I was hurting and feeling all crampy. I thought for sure I had hurt myself somehow. I had a hard time sleeping last night because I just felt so bad. Not nauseated or anything - just bad. That's pretty much how I felt for 9 months with Valerie. I never felt like myself. I always felt "off." We'd go somewhere, and I'd almost pass out. And that is how this pregnancy is turning out to be too. I just don't make a good pregnant lady. I wish I felt good and could enjoy it more, but it's so hard when you feel bad every day all day. I have no energy at all. It's so hard to do anything or go anywhere. There's so many things I want to do, but I just don't see how. I can't keep up with anything around the house. I think I've decided to talk to Clint about hiring a cleaning lady. I'm thankful the morning sickness is not as bad as it was the first time, but part of me still dreads the 7+ months to come when this is just the beginning.